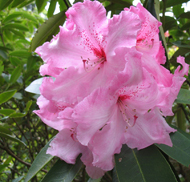 The Photo Exhibition is a non-competitive celebration of everything Rhododendron. This is your opportunity to share your favourite photographs! MARS will be mounting a photographic display focusing on rhododendron species and hybrid plants or trusses, and photos from public and private gardens. All conference attendees may enter. Photographs should be 8” x 10”. Photos may be unmounted, or mounted on poster board or foam board no more than ¼” thick. Maximum size of photo and mounting board 12″ x 14″. Frames, glass, canvas or metal cannot be accepted. Photographs may have minor adjustments to exposure, colour balance and cropping. Please submit photo registration form below as soon as possible, since exhibition space is limited. Entries without pre-registration will be accommodated if space allows. Please put your name, email address, phone number and ARS Chapter on the reverse of each entry. Your name and chapter will be displayed under the photo for the public to appreciate. Remember to pick up your photos before you leave the conference. I agree to allow ARS and MARS to display my photos at the ARS 2019 Fall Regional Conference Photo Exhibition, and I understand that my photo(s) may appear coincidentally in the background of publicity photos. ARS and MARS will not use closeups of my photos without my express permission.